The dark lords are gathering, ancient powers are awakening, and a chill has fallen across the land. Fantasy Flight Games went gone expansion crazy with this spiritual successor to the old Talisman fantasy adventure game. It has been criticised as suffering from a lack of player interaction and a long turn downtime, but later expansions attempt to address this. Good for playing solo. This rules summary is for the basic second edition game. I played Runebound 3rd ed a few months back. It inspired me to get out my (large) RB 2nd edition collection for a few plays. I found to my dismay that the flip a card, try to roll a number style of that game doesn’t do it for me so much any more. RB 3rd has more going on while also being streamlined. I switched to 3rd and haven’t looked back. I look forward to your sheets for 3rd edition, Peter! 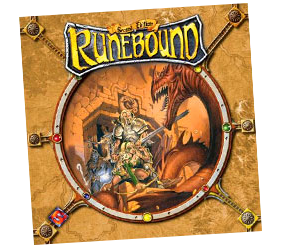 I’ve been wondering whether to get it, though all flavours of Runebound are a bit ‘solitaire’ for me. Not enough player interaction. It is still largely solitaire, but other players get to participate in your battles by controlling the enemies. The new combat system has some decisions to make, and is much more interesting than just trying to roll a number. The experience has been upgraded and modernized overall. It is now somewhere in between Eldritch Horror and Talisman. Do you like casting the tokens for combat? I do like the tokens. I already have dozens of games that resolve combat using dice. The tokens are something different, and it is a good system. You resolve initiative, damage, defense, and special abilities all with a single flip. The decisions you make range from obvious to slightly tricky, and the resolution is more interesting than just adding up you numbers. Perhaps best is that when you acquire items you also get unique new tokens to add to your pool. This really makes it feel like you have acquired a new item instead of just a +X bonus to your rolls. Two things put me off Runebound 3…. the token tossing and no option to upgrade from Runebound 2, as I bought several expansions. As for the ‘solo’ aspect… it’s why I bought it… pass time when friends couldn’t make to games night. I usually don’t like to solo games where you need to make decisions for the enemy against yourself, but I found this to work just fine for RB3. The choice of what the enemy would do is usually obvious, and when it isn’t I just roll a die to chose between reasonable options. The built-in timer makes it otherwise very good for solo play. If you play the Vorakesh scenario, you’ll need to control multiple heroes though to keep the Zombies under control. The Margath scenario is fine with one hero.